It was a muddy one at the pumpkin patch today. 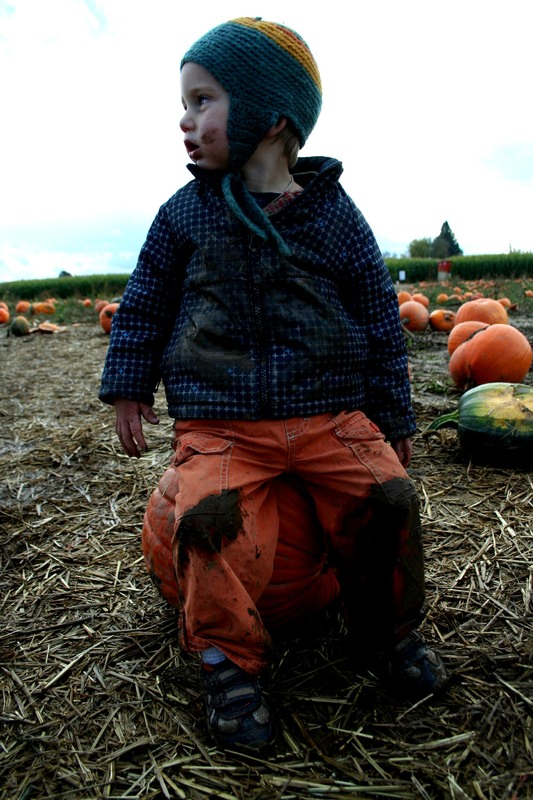 This little guy, who has been saying “my halloween patch” and “my pumpkin” at night when we go to bed–even though he had no idea what the halloween patch was–kept slipping onto his hands and knees and was pretty dirty by day’s end. But he didn’t mind and he picked out a sweet, little warty pumpkin and I think it is safe to say he may be bringing it to sleep with us tonight. He had a good time. We still haven’t tasted any of our own eating pumpkins yet, not really any winter squash either. One of my own favorite veggie families, I am thinking about making a curry-peanut or curry-coconut squash soup soon, maybe this week, with some Asian mustard greens stirred in. All that orange today in the pumpkin field has me thinking about cracking open a few. And the cool weather. It is that time of year again. For now, I need to try to stir my late-napping, pumpkin gathering boy and wash him up. Already so much bigger than the baby pumpkin he started out as. Already adding his own take on the season, the routines. Another person ready to take on the world.